Of course, any student of world history, knows that the Philippines was a colony of Spain for over 300 years. 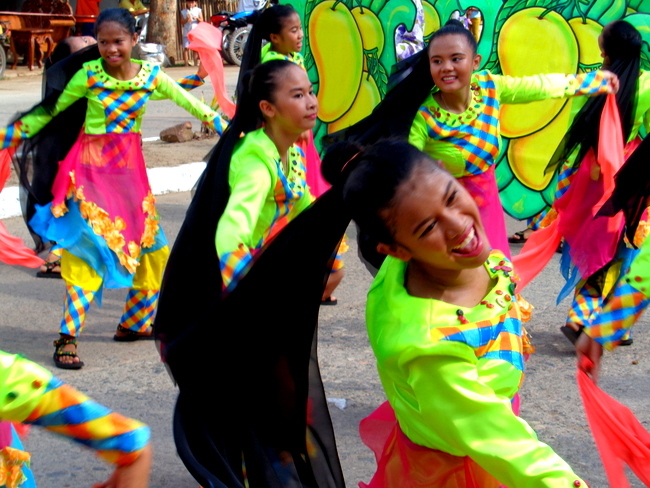 And since history was one of my favorite subjects in school, it should have come as no surprise to me that fiestas would also be celebrated in the archipelago: most Filipinos I know do like to dance, drink and eat. And you can find all of those elements in a fiesta and more. 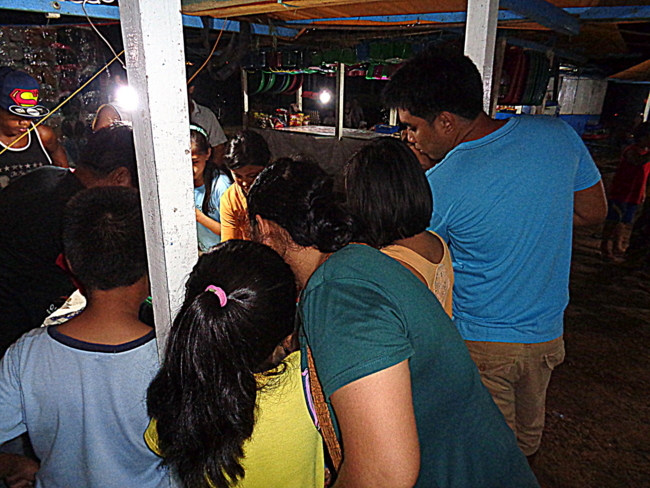 So after my initial bewilderment, I celebrated my first fiesta in Guimaras at “The Compound,” my spouse’s home in a “subdivision” known for its muddy, cow-poop laden roads. Regular readers that have been with me since the days of “The Rooster Crows at 4am!” will not be shocked to learn that the road is even muddier and there is still no shortage of cow manure on the path. After six years of living in the Philippines I’ve celebrated a few fiestas and festivals and have learned that it is wise not to try and keep up with any relatives in their consumption of Red Horse Beer during these celebrations. However, if you want to suffer the effects of one of the worst hangovers in your entire life, go ahead. Don’t say that you haven’t been warned. 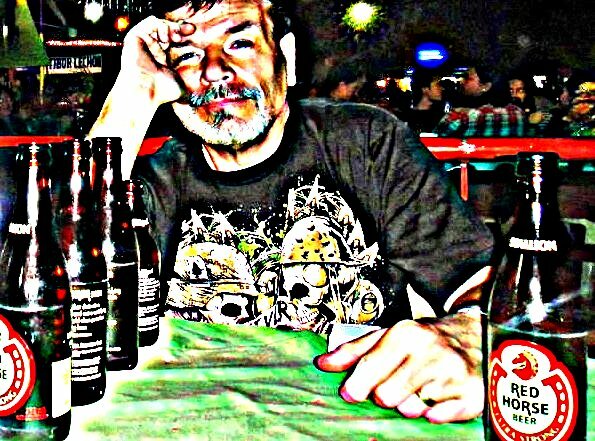 Regular readers of Philippines Plus will also know that I will occasionally extol the “virtues” of beer drinking and have been known to quaff an adult beverage or two with fellow expats. Truth is, I’ve only had two beers in the last four weeks. No, I’m not a recovering alcoholic as some people might have been led to believe, I haven’t been hanging out with the usual group of suspects and have been busy with projects at our new home in the Philippines. This post will also feature the return of comments to Philippines Plus. I will attempt to answer any comments on a daily basis. Six years of living in the Philippines have given me some insight into living here which, quite truthfully, cannot be garnered on a two-week vacation. I do know something about living in paradise, so if you’re receptive to advice from an old fart geezer expat, then this blog might be the place you could pick up a kernel of wisdom. However, there are guidelines for leaving comments. While I have used some offensive language in the past, that will no longer be the case. I will delete any comments that I deem too offensive or abusive. This is my website. I have advertisers. The advertisers demand certain standards. Call it censorship if you like but this website puts pesos in my pockets. This year’s fiesta time is low-keyed for our family. We don’t live in the same barangay anymore and we’re not even going to go into town to visit relatives and eat and drink which is the traditional way to celebrate. We did take our little niece and nephew to the carnival last night but our niece “JalAmiel” said the Ferris Wheel was going too fast and since that was the only ride, the kids spent the bulk of their time gambling. Alright, now you might think that minors wouldn’t be allowed to gamble in the Philippines. Au contraire, my little buttercup, the kids played a game of chance where they bet and won (or lost) as many pesos as they could. There’s no age limit on this carnival gambling game. As long as the kids didn’t bet our new house, I didn’t care. They were having fun. After finding some french fries for 15 pesos, my wife and I were watching our niece and nephew when a man approached me: “Do you know English?” he asked. Standing before me was an African American man from Seattle. He had spotted me in the crowd, “you’re like a giant,” he informed me, though I am only six feet tall. But compared to the typical Filipino, one of the smallest people on the planet, on average, I do stand out. Michael was waiting to ride the Ferris Wheel. At 20 pesos a ride, 43¢, it’s a bargain that one can’t find in the States. I chatted with Michael for a few minutes while he waited for the carnival ride to resume. I always ask any foreigner I meet as to why they are in the Philippines. I explain my nosiness by informing them I have a website where I write about living in the Philippines. 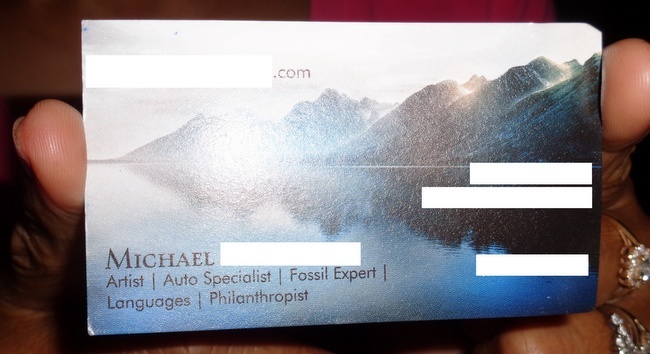 After handing me the card, Michael excused himself. The Ferris Wheel ride was starting again! After the ride was over, the American returned and I remarked, that by the number of job skills listed on his business card, that he was quite the Renaissance Man. We chatted for a few minutes, shook hands, and remarked that we might meet each other again. I hope so. He was quite a pleasant man to chat with and I would enjoy speaking with him again, fiesta or not. Oh, and for those readers out there keeping count, I only had one bottle of beer the whole evening. A warm bottle of San Miguel Pale Pilsen. And after that, I had to pee. ← Do I Recommend Neptune Pittman’s Garden Resort in Guimaras? Nice and sunny in Manila today been raining heavy last few days, Derek in pasig. Thanks,great to hear from you, Derek. Actually, as you probably know, drinking a beer or two is good for your health. My wife also complains that I am going deaf. Maybe I should pay a visit to the doctor. We’ve had some welcome rain, also. Helps cools things off. Glad to see this site operating again Dave.. Its a important resource for everything that relates to Guimaras.Really appreciate all the detailed content. Hope your enjoying the new home, must be nice ! Glad to see the comments back. Always nice to see some new foreigners in your area. Well, Michael doesn’t know how long he will be around, Papa Duck, but it is always good to have some new folks to talk to. Great to have you back…again congrats on the house. Keep up the good work. Going to try to hit the resort there later this year…looking forward to meeting…and of course a beer. Looking forward to your visit, Roxas Ron. We’ll be hitting Raymen Beach late in October to celebrate some birthdays. Let me know when you plan to visit and we can quaff a beer or two. Welcome back Dave,Glad you are all ok there and your new home is well settled.hope you enjoy the beer at your terrace. glad to see the comments back. your house looks wonderful and i’m sure you and your asawa are busy with getting things situated and enjoying your new home. wev’e had a good summer here but now it’s time to head into the dreaded winter of IL. my asawa is getting anxious as we will be heading to sorsogon city philippines on the 12th of october. for a 30 day visit to are home there. sorsogon also has there big kasakayan festival in october. which is a fun time. it’s the celebration of sorsogon becoming a province. Thanks, Roger. I remember many an icy drive to work on I-55 on my way to work. I won’t miss that commute at all. The biggest thing I have to worry about on the road here are tricycles, jeepneys and carabao. Have a great visit back to the Philippines and have fun at that festival. Damn it Dave!!! Serious. I actually thought you might have died. It was only a couple of weeks ago that I saw a new post and figured out you had another site. Jesus!!!!! Serious. I was really sad that you might have died. Didn’t see a post on this site for months. When I figured out you were alive…I was so relieved. Honestly, I don’t even know what the above post was about! I am just happy comments are back and you are not dead! LOL. Thanks, Todd, I’m not dead yet but each day brings me closer to Jesus. 🙂 I’m going to make a serious attempt to keep the website updated and continue working on my new site, Live Philippines. 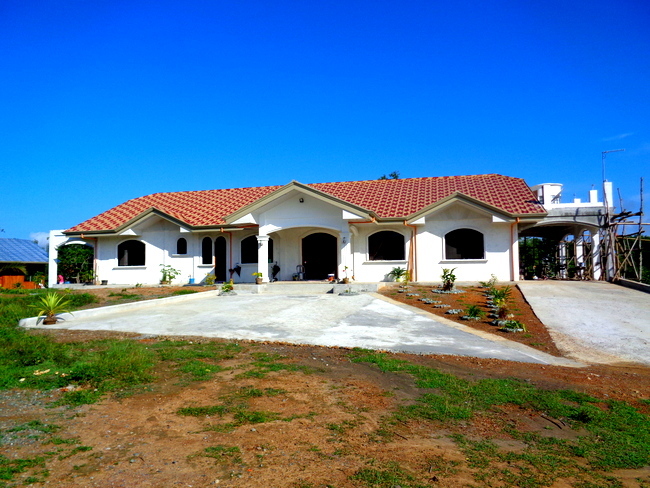 Most of the work has been completed at the house for now and we only have one worker, our brother-in-law, on site. Count me in as one of the readers who worried that you’d either went to that big website in the sky or forgot us during one of your festivals highlighted by beer, babes and the almighty mango (see I HAVE been paying attention!!!). Anyway glad to see you back and would like to see more photos of the house. Looking forward to your second site. Thanks for the concern, Joe in Michigan. I’m not ready to cash in my chips yet and hope to hang around for many more years to come despite my advancing age. 🙂 I’ve recently renewed the domain name for Philippines Plus for another five years so I plan to stick around. My gosh, you have been paying attention, thanks. Well Dave, you are more popular than you believe. I am sure me and Joe were not the only ones worried about you. And yes, more pics of that beautiful home would be great. And a video tour would even be better! Thanks, Todd, I appreciate the kind words.